Waterproof EVA foam door sweep prevents heat loss in winter and air conditioning loss in the summer. Door bottom seal self-sticks; 1 1/2"W x 39"L size trims to fit. Keeps insects outdoors, too. This product keeps air from coming in the house at the bottom of the door. Much cleaner looking than using a towel at the foot of the door. Easy to install. Works for me! The clear is perfect for any door. The clear strips are all but invisible on my wood doors. The adhesive is excellent. This product works wonderfully to cut off air leakage. I just wish it came in a roll instead of strips for better customized use. I got the clear strips and they are all but invisible on my wood doors. The adhesive is very good and trimming to fit is easy. These strips solved my air leakage problem perfectly. I have utilized the door sealer for not only the entry door but for my shower floor to ceiling shower door to prevent water damage to my bathroom floor and woodwork. Best weather stripping I have ever tried. This is my second purchase of the door seal. I didn't think it would do what I wanted but boy was I wrong. No tools to install and quaility was top notched. Stops bugs and drafts ! Very easy to apply. Lasts a long time. Is paint-able. Really works to stop bugs from crawling under the door and stops drafts that bring in dust, dirt and rain. Good, strong adhesive backing. The weather stripping had come off of my outer door and I thought I could just go get another one at the store but I couldn't find one anywhere. Then I saw this item and thought it might work. It was exactly what I needed and does the job just fine. It is just the right size and length. It is only enough for one door so if I need another I know where to go. I use this on my bedroom door. The door lets light in under the door, So I tryed This Product and it works GREAT, NO LIGHT, THANK YOU. They are easily attached and really work. The double sided cloth ones move and bunch up-these do not and block the cold. I purchased this weather stripping for my daughter's front door but accidentally left it in the package along with the support socks I ordered for my mom who has neuropathy of both feet. My dad thought it was for them and used it on their front door and every time I go to their home, they comment about what a good job it does. the bill to a T.
I apply this strip to the inside of the door of my apartment in a multi-unit, high-rise building. It works extremely well during the summer in keeping my cold, air-conditioned air from escaping due to the space under the door. I remove the strip in winter because it's not needed. This strip is so economical (and even more so when you buy more than one at a time) that I can easily remove and replace it each season, if necessary. Easy Solution to Winter Chill !!! It had taken 5-minutes to install on bottom of front entrance door...it immediately sealed that Drafty problem, and saves money for home heating!! Simple, works, the clear version is almost invisible. Keeps drafts out and keeps air conditioning in. Mine has lasted for years--just purchased a few spares. stick very good on bottom of door. I use this to seal doors so cold air doesn't come in and it does seal against rain coming in. I wish they would make it longer to use as a seal for the whole door where cold air comes in and not just at the bottom of the door. Very easy to install an keeps the cold air out! I have no complaints about this product.I put them on my back doors and they really do keep out the cold air. Thank you for offering a product a woman can install with no tools. this was so easy to install--even for a blonde!! The seal has been in place for six months and has helped seal out the cold and heat. Although I don't need it for the bottom of my doors, I used this product to stop drafts coming in through the spaces between my doors and surrounding molding / doorjamb. It works GREAT!! COMPLETELY stopped the cold air!!! Even with constantly opening and closing the door, it remains in place. Takes about 3 rolls to cover both sides of one door. I'm ordering more! Applied easily. Does the job! Stops leaks, cuts fuel bill. 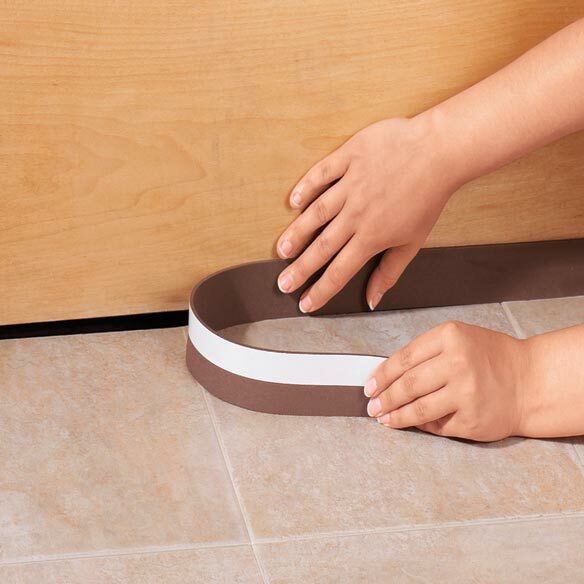 I put this vinyl door sweep around all the door edges,not just the bottom. It stopped all air leakage around the outside doors really well and cut my fuel bill significantly. Really easy to install, and stays up all year. Very easy to install. It works to block the outside weather from getting into your home. Used the product on the doors at home. Works very well to keep the cold out. It holds up very well and is easy to apply. So far this is a good product it keeps cold air out and I like the color because it match my door. It's doing its job keeping the rain from comming in my home. No More Draft for me! Have used before and want for other doors. This product was a good base price (I did some shopping around for similar products on [...]) [...] 3 weeks later, the tape is still sticking! (but to add a disclaimer, it is not exposed to the elements--I live in an apartment with closed hallways.) It prevents the space under my front door from making a whistling sound when I open my windows. It does the job I wanted it to. Satisfied. I bought two. One for the front door and one for the back. These are two doors that are not used everyday, but it seems to be good for what I bought them for. I live in a building, and my neighbors smoke. The nicotine smell carries to the hall way and comes in thru the cracks of the door into my Apt. bottom and side cracks, therefore, I use it there and it prevents the smell from entering the house. Also preventing drafts. Keeps small bugs and critters out! Attached easily to bottom of steel doors on country home as means of keeping small critters and nighttime bugs out. Has been excellent! As a plus it even keeps rain from seeping under the doors. Floors have stayed cleaner and the transparent stripping is virtually unnoticeable on doors. If a roll of this were available I'd buy it since I'm reordering more to put on all exterior doors. Just peel off the tape and adhere the stripping to the door. In my case it is an ill fitting storm door. I had to reposition it a few times as I cannot kneel down to do it but after three trys got it exactly where I wanted it. I ordered more. At first, was not sure about how good it was. I cleaned the surface of the door with alcohol and attached the strip. It gives a tight seal and looks very nice. My door is a cream color and used the brown strip with it...so nice looking. It is firmly sealed to the door. It's a five but only gave a four because down the road, not sure if stays attached.It is a wonderful product. Truly am pleased with this weather strip. Not a bit of draft coming in. I used it on my back door and it worked great. Easy to place and stayed on. I had a terrible draft coming in under my kitchen door. The Bottom Door Weatherstripping stopped the draft cold! I was east to cut to fit and it installed in just seconds. Well worth the price. We had a space on the SIDE of the door, so I used it there. It seems to keep the cold out like it would if it were on the bottom of the door. Nice to stop the icy breeze coming under the door between the kitchen and back porch. No doubt saves a bit on the heat bil too. Good for my front door. Doesn't quite reach the floor on one side. Not the fault of the "door seal" as the door has bigger gap on one side. This product fits great and was easily installed on my recliner and it stays in place. I use as door sweep and works very well. Little difficult to apply but got it done properly. This product stops the wind that was coming in under my door. I am so glad I found such a perfect answer to my problem! ..easy on and stays on. also have used a kitchen door that the dog goes in and out about half a dozen times a day and strip stays on. Our front door has never fit right since building our home. This really help to keep insects out. This was easy to attach and hope it stops drafts and keeps in the heat and air conditioning. I have a balcony and the sliding door does not seem to close together in the middle like I believe it should. I do feel cold air and when the wind is in high gear, I get serenaded by whistles. I know this product is supposed to used at the bottom of a door, but I thought maybe they would work verically as well. So far I have had no cold air and no whistling sound. Not sorry for trying it this way. Seems to worker great,keeps out cold air into our garage. I purchase the product for my door does'nt hold the glue for long. Used it to fill in gap left by door sweep on screen door, seems to work well in keeping out bugs! Easy to apply and features are quick to see. "This does the job" Easy to attach! Needed this item for our new storm door. Saw, bought, and put on the bottom of the door. Works great. Keeps out all kinds of weather. Be sure to chuck the drag on floors that are carpeted to prevent pulling off. Can be easily tacked in place for more permanent placement. Energy saving. This easy-to-use product fits the bill and is so easy to install. What a difference it made in stopping the draft coming through our side door! I used 2 rolls, but it still didn't cover the entire length of the door and you can really feel the breeze in the 1" spot not covered by this product. The house is much warmer and I'm sure the propane bill will be less this year as a result. My only complaint would be that it's not long enough to fit the entire vertical length of the door with just one roll - not even 2 rolls! It keeps the drafts out but it doesn't stay stuck to the door for long, had to put glue on it. This product does what it say, "will keep cold weather outside" if its applied right and that's easy to do. If this was longer I would buy it again. I bought this to put at the bottom of my outside door,It works great but I needed it to be a little longer. I used it on my front door, color is light for my door and even I cleaned my door, it doesn't steek well. I am waiting on my "peeps" to install on basement door. Because of rug and doorway configuration I could not get these to work on my doors. They may be okay, depending on how your doors open and the distance between bottom of door and floor covering. Does the job without haaving to replace the door for now. Cheap material and the adhesive doesn't stick well. Had to use duct tape to get it to stay. Comes all folded up and doesn't smooth out well like shown in the picture. I was disappointed in this weatherstripping. There was only enough of it to do the bottom of one door, and the adhesive was weak. I couldn't even use it. Could have made the rubber thicker and stronger. It bend backward when shutting door. Doesn't stick well or stay on after minimum use! Wouldn't even pay a penny for this had it a day wont stay on then it broke never buy again. This is just cheap thick white tape that doesn't even stick. This product came all rolled up. When I un rolled it I couldn't get the creases out of it and therefore wouldn't stay on the door. Also, this is very cheaply made. I realize that this isn't vey expensive..but it all adds up doesn't it ?? To close gap from door to floor would leave some of the adhesive exposed to collect dirt. too light, too thin. does not work. product does not do what it say it will. I like my Bedroom Window opened a little in the winter. So I 'm buying this to cover the little gap under the door to keep the room cooler. The building I live in (settles) and my doors needs some fixing. Need weatherstripping again for my front door and haven't been able to find it. Have double doors leading out to screened in porch and wanted something neat looking to hold out the cold in the winter. Have two doors on north side of house that let in drafts. sweeper came off garage door. We have a gap at the bottom of our door and get alot of air, dust and light through it. Hopefully this will block it. I have to replace the old one. I need a solution for the draft under my windows which don’t seal properly, and also the top of my door which has a rip in the weatherstripping. I have drafty doors and needed something to block them...this looked easy enough for me to try. To stop the cold from coming under my door. To use for door to garage from Laundry room. Hoping to cut down on draft. To use on storm door to make for a tighter fit to floor. Jast what I need to block cool air underneath door. my doors are white, does this strip come in white? Could you use this on the top of the door? Can be installed on top too. I used it to fill in a light gap on the side. Still holding and served my purpose. Yes, it worked well. I used it on the top and bottom of my doors. What side of the door do you put it on?